Vishaan Chakrabarti: How Can We Design More Welcoming Cities? Vishaan Chakrabarti on the TED stage. Part 3 of the TED Radio Hour episode Building Humane Cities. Architect Vishaan Chakrabarti says many modern cities feel cold, austere, and anonymous. He advocates for designing more vibrant and inclusive cities that are reminiscent of the scale of older cities. Vishaan Chakrabarti is an architect seeking to redefine urban life around the world. He believes well-designed cities can create more prosperous, inclusive, egalitarian societies. He is the author of A Country of Cities: A Manifesto for Urban America. Chakrabarti is a professor of architectural design and urban theory at Columbia University. He is also the founder of Practice for Architecture and Urbanism, an architecture studio that supports and advances urbanization. So, Vishaan, please introduce yourself. VISHAAN CHAKRABARTI: OK. My name is Vishaan Chakrabarti. I'm an architect and author. I'm also a professor at Columbia University. RAZ: Vishaan was born in Kolkata, India. But as a kid, he moved to Massachusetts, where he often felt like an outsider. CHAKRABARTI: I grew up in a suburb outside of Boston, kind of hated every minute of it. It was a very sort of racist, violent upbringing. And for immigrants especially - I'm a first-generation immigrant - you speak differently than other people. You look different though than other people there. And so there's this tendency to feel a little homeless or lost. RAZ: When Vishaan became an adult, he ended up relocating to New York City. And for the first time in his life, he didn't really feel different. CHAKRABARTI: You know, what I immediately encountered when I came to New York was this feeling like I had kind of discovered a long-lost twin brother. No one really questioned whether you belonged here. You belonged automatically by virtue of being here. And I think one of the great things that a truly great city does is provide this sense that you belong by virtue of who you are, not, you know, what your background is. RAZ: And that got Vishaan thinking about what it was that made the city so welcoming. And after becoming an architect, he noticed that a city's vibrancy and inclusivity has a lot to do with how it's designed. CHAKRABARTI: If you think about architecture as an act of writing in the city, you have to read the city first. And all of the basic components are human components. They need to invite diversity across race, gender, sexual orientation and especially class and socioeconomic structure. RAZ: And he says the key difference between a welcoming city and a less welcoming one is scale because so many of our modern cities were designed around big, anonymous buildings with streets that aren't walkable and almost no places for people to just gather. But Vishaan says older cities around the world were built on a much more human scale. CHAKRABARTI: It's not a one-size-fits-all thing. But I think pre-20th century cities all around the world tend to be much more dynamic, lyrical places. So Venice - let's just take Venice. UNIDENTIFIED MUSICAL ARTIST: (Singing) Bella, bella notte. 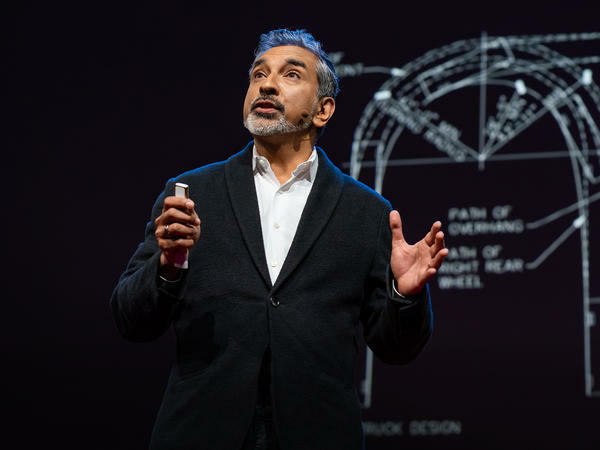 CHAKRABARTI: You look at those arched pedestrian bridges. You're going over a canal. The clearance is actually quite low, so the person who's operating the gondola is standing. And they know they have to duck to get under the bridge, so they don't call a lawyer when their forehead hits the bridge because they made a mistake. They know it's their responsibility to duck. CHAKRABARTI: And usually, that apartment building had, like, 20 units. And you see that each building is maybe 50 feet long, 60 feet long. And so you get this tremendous variation. One is brick. One is stone. Doorways are different. And so you have this kind of rhythm along the street. You run into your neighbor. Everyone knows each other. It's very communal. That form of building isn't legal today because of fire codes and wheelchair regulations and a whole bunch of things. So now you need, you know, a few elevators. And you need two sets of fire stairs. And that's all connected by a long, anonymous hallway. And suddenly, a developer is really incentivized to build a 200-unit building instead of a 20-unit building in order to sort of amortize all of that cost. And as a consequence, it's very hard to know your neighbors in a 200-unit building. And so the scale at which we build is different and more mass-produced. And so you see the same building landing in Shanghai, in Mumbai and Dubai. And so I don't think one has to be an architect or an urban planner to understand these issues. I think people are feeling this viscerally. I hear this everywhere I go from everyday people who aren't trained in this at all but feel is kind of creeping homogenization of their world. RAZ: Vishaan Chakrabarti picks up his idea from the TED stage. CHAKRABARTI: Now, maybe you think I'm just being nostalgic. Why does it matter? Who cares if there is this creeping sameness besetting our planet? Well, it matters because most people around the world are gravitating to urban areas globally. And how we design those urban areas could well determine whether we thrive or not as a species. And this is not just an aesthetic issue, mind you. This is an issue of international consequence because today, every day, literally, hundreds of thousands of people are moving into a city somewhere. And when you think about that, ask yourself, are they condemned to live in the same bland cities we built in the 20th century, or can we offer them something better? RAZ: ...Or San Francisco or Boston or London or Paris. CHAKRABARTI: Yes. And, in fact, one of the things I worry about with the U.S. is, you know, there's a lot to compliment about European cities. But one of the things we need to be really careful of is most European cities have almost all of their poor people living on the outskirts, on the periphery. CHAKRABARTI: ...Because, you know, it's out of reach. Now, there are ways in which government subsidizes affordable housing. But as an architect, one of the things we're looking at is, how do you lower the cost of housing so that construction costs can come down? And that allows people to charge less rent than they otherwise would. And this is where mass transit infrastructure and infrastructure more generally is so important because we don't have to think about the city as just the city limits. There's a region around every major city. And if we have better mass transportation to get people to work from 20 or 30 or 40 miles outside of the city, then they can live a transit-oriented lifestyle without living in the heart of the city. And a lot of people will choose that if we give them good transit options. And we're actually seeing those transformations happening all over the world in big ways and in small ways. RAZ: In just a moment, Vishaan imagines how technology could help us redesign cities and allow us to bring the humanity of older cities into the 21st century. Stay with us. I'm Guy Raz, and you're listening to the TED Radio Hour from NPR. RAZ: It's the TED Radio Hour from NPR. I'm Guy Raz. And on the show today, ideas about cities and how we can build more humane ones. And just before the break, we were hearing from architect Vishaan Chakrabarti. And Vishaan says design could be part of the solution, but it largely depends on how we use technology. CHAKRABARTI: Technology was a big part of the problem in the 20th century. When we invented the automobile, what happened is the world all bent towards the invention, and we recreated our landscape around it. In the 21st century, technology can be part of the solution if it bends to the needs of the world. And so what do I mean by that? Take the autonomous vehicle. I don't think the autonomous vehicle is exciting because it's a driverless car. I think what's exciting about the autonomous vehicle is the promise that we could have these small urban vehicles that could safely commingle with pedestrians and bicycles. That would enable us to design humane streets again, streets without curbs (ph), maybe streets like the wooden walkways on Fire Island. Or maybe we could design streets with the cobblestone of the 21st century, something that captures kinetic energy, melts snow, helps you with your fitness when you walk. Or remember those big-ladder fire trucks? What if we could replace them and all the asphalt that comes with them with drones and robots that could rescue people from burning buildings? And if you think that's outlandish, you'd be amazed to know how much of that technology is already being used today in rescue activity. But now I'd like you to really imagine with me. Imagine if we could design the hovercraft wheelchair - right? - an invention that would not only allow equal access but would enable us to build the Italian hill town of the 21st century. I think you'd be amazed to know that if just a few of these inventions responsive to human need - would completely transform the way we could build our cities. RAZ: I mean, the thing is - right? - let's say we do transform cities into these more humane places, like, with the help of technology or whatever. I mean, there will still be some level of inhumanity in them, right? RAZ: I mean, it's not - is it possible to have no social discord at all? CHAKRABARTI: You know, part of why I gave the talk I gave at TED was being cognizant of the fact that there were a lot of technologists in the room. And technologists can be wonderful people, but they can also be a bit ahistorical. And what I was hoping to convey to a roomful of technologists is we need them to invent stuff that helps us build more humane cities, right? Firefighting drones and, you know, different kind of a wheelchair, and so forth. So we can look at all those codes and standards that we have to build with and change them, so we can maybe have a kind of "Back To The Future" moment and think about what was great about cities before the 20th century that could maybe inhabit our cities in the 21st and 22nd century because technology's allowed us to change those standards. But that's not the goal. The goal is those standards are changing, so we can design this infrastructure, so we create more social friction. Cities, at their best, are engines of social friction. So if you look at the Arab Spring, and you saw what was happening in Tahrir Square, or you saw what was happening in Tunisia, it's because cities tend to be the platform for social change in nations. And social friction requires a kind of - in my book, I call it an infrastructure of opportunity. This idea that you're building public spaces, subway systems, the farmer's market - places where people who are from different walks of life meet eyeball to eyeball - because social friction is fundamentally what advances civilization, and I think that's really the heart of it. RAZ: Architect Vishaan Chakrabarti. He's a professor at Columbia, and his latest book is called "A Country Of Cities: A Manifesto For An Urban America." You can see his full talk at ted.com. Transcript provided by NPR, Copyright NPR.